Many people snore because they sleep on their back. The good news is that simple causes have simple solutions: if you sleep on your back, it’s time to try sleeping on your side with the help of some simple techniques you can engineer at home. Making this basic change – without the need for any invasive techniques, complicated devices or significant expenditure – can have a huge impact on your snoring or sleep apnea. More than half of sleep apnea cases are referred to as “position-induced” where apnea is only experienced when the sufferer is on their back (supine) . When you sleep on your back, your airway becomes compressed. The weight from your neck, a recessed jaw and your tongue falling backwards all lead to a greater chance of airway obstruction and the ensuing noise. If you end up supine when you sleep, a tennis ball on your back can be used to condition you out of this habit. This rudimentary yet effective hack is so well known that it has infiltrated the snoring-science academic literature, even sporting its own abbreviation: TBT! Tape or sew one to the back of your pajamas to make sleeping on your back difficult. What do we do when faced with difficulty and discomfort? We naturally avoid it. Now, crucially, sleeping on our side! It doesn’t have to be a tennis ball. Any object small enough to fit, but large enough to be an obstruction will do the trick. Some people even recommend putting a squeaky toy on their backs, adding some audible alarm to the physical discomfort! There are also products available that use semi-rigid foam pads strapped to the back that effectively mimic the tennis ball. Unlike the tennis ball however, they also provide a degree of support because of their wider shape . You can replicate this effect by sleeping with a small, filled rucksack, a technique employed by soldiers in the American War of Independence to stop themselves snoring and giving away their position to their enemy. Whilst these techniques work for some people, there are obvious downsides. Snoring solutions are only ever effective if they are actually being used, and many people give up with the tennis ball technique as it is just too uncomfortable . The humble tennis ball has many uses beyond training your sleeping position. Using it as a sporting object means you are getting some exercise, a great way to lose weight and keep fit which is one of the most effective ways of reducing snoring. You can also stick them in the tumble dryer to plump up down-filled pillows after washing – something else you should consider if your snoring is caused by pollen or dust allergies. Try sleeping with your back propped against something to prevent you from rolling onto your back. If your bed is against a wall this can be ideal. If not, try propping yourself against some pillows. Experiment with different configurations, making a note of what works best for you. Some people can find side sleeping a bit uncomfortable. In this case, it can be useful to place some pillows between your legs. This can help keep your legs and adjoining muscles at a more natural and comfortable angle, as well as preventing the bony parts of your knees knocking together. Get an inflatable pillow about half the size of a normal pillow. Inflate it to almost maximum pressure so that it is very firm. Put it inside an empty pillowcase. Sleep on the empty portion of the pillowcase to stop it moving away, with your back resting against the firm pillow. 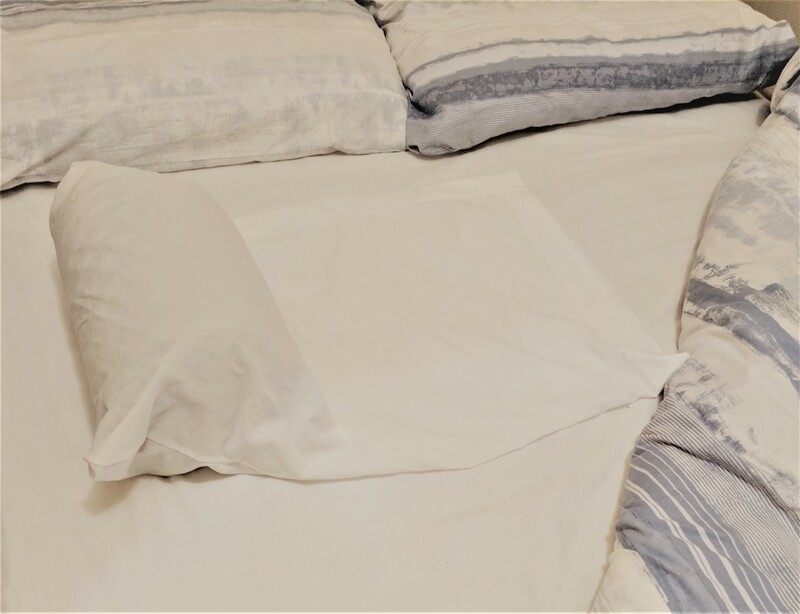 Read Michael’s story, a SnoreLab user who trained himself to sleep on his side to combat his snoring. Our sleeping position is deep rooted. Making this change can be like changing the way you walk, or which hand you use to write. For some it’s simply not possible. 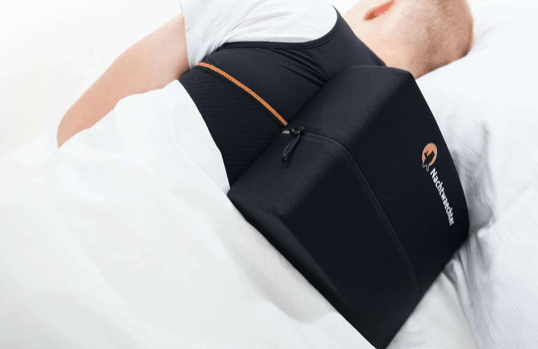 If you are a committed back-sleeper, fear not, there are snoring solutions for you too. Head elevation is the solution for back sleeping snorers. This prevents you from being entirely flat where you airway is most vulnerable to the effects of gravity. Studies have seen that even slightly elevating your head can dramatically reduce both normal snoring and sleep apnea, with patients in these experiments showing a 32% reduction in their sleep apnea severity ! You can do this very effectively with a wedge pillow, the unsung hero of the anti-snoring world. 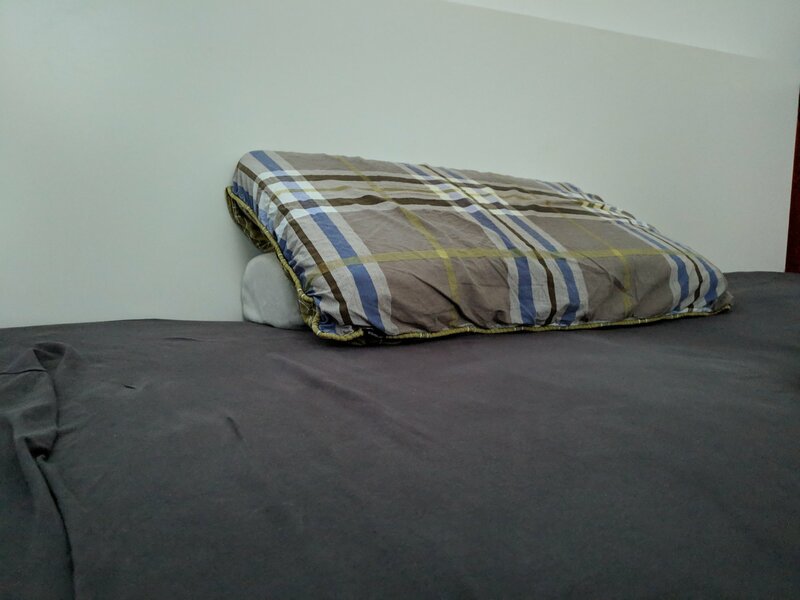 You can create your own (maybe slightly less robust and comfortable) version with some clever pillow arrangements. 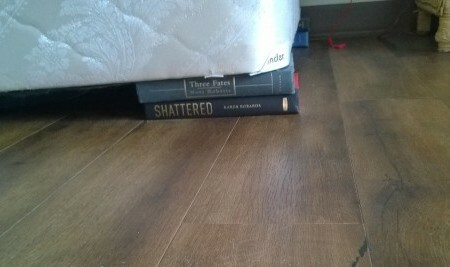 There are also ways to hack this with just a few books; stick a couple under the head end of your bed to subtly raise it. This little elevation can make a massive difference. The influence of sleeping position on snoring and sleep apnea is huge. Understanding how you sleep and what effect this has on your snoring is vital information to help you identify your snoring triggers and solutions. Sleeping position is a habit that is deeply ingrained, so can be hard to change. Keep track of what position you wake up in and what techniques seem to work. Positional therapy will require some time and trial and error, but persist! Unlike a lot of other snoring solutions, these basic positional techniques are non-invasive. Crucially, they don’t require much investment of money or effort and can prove extremely beneficial if stuck to. 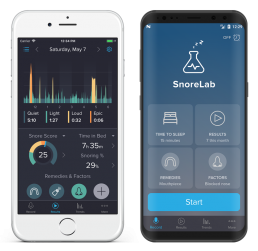 Finally, remember to select the “side sleeping” or “positional therapy” icons in the Remedies menu in SnoreLab to track how changing your sleeping position is influencing your snoring.